Amazing collaboration between Vittorio Nistri(keyboards, effects, sampler and Alberto Fiori Carones(guitars) with an extra help on few tracks by Sandro Biagi(saxophone) and Barbara De Stefani(vocals)! In those 40 minutes, they mix and mash a good dose of experiments touching the no wave, the ambient, the synth-pop and somehow a bit of electro-rock. Definitely a tape with some original music and sounds. 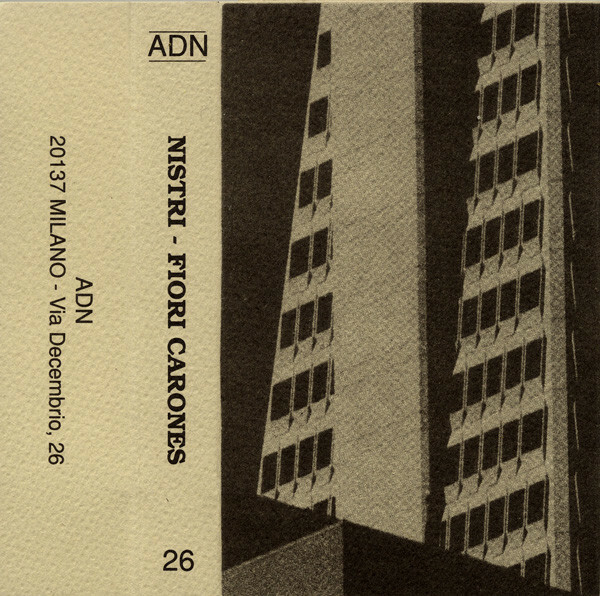 ADN was established in 1983 as the first Italian fanzine for experimental new music published in English, released lots of tapes and some vinyl of industrial/electro/noise until the early 90s and went on a long hiatus. ADN restarted their activities in 2014, their actual webpage is here.